As you can imagine, nuclear power plants have extremely stringent chemical storage requirements. When our clients are focused on safety, they turn to Houston PolyTank for their most complex storage containment needs. 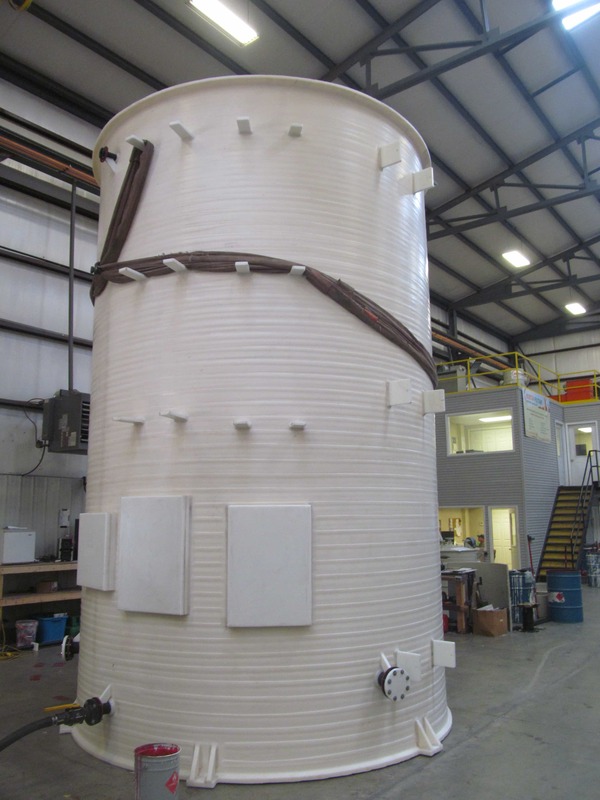 Engineers at a nuclear power plant needed a large chemical storage tank to safely hold sodium bisulfite. Houston PolyTank created a double walled containment tank with an interior tank that holds 8,700 gallons and is surrounded by an exterior 10,000 gallon containment tank. The client specified quite a few “add-ons” they deemed critical to actively manage and properly maintain this aggressive chemical for use in its processes. There are several exterior features on the double walled tank: mixer mount, caged ladder top handrail and a reverse float indicator. A freestanding mixer mount is a support for the mixer and attaches on top of the tank. In order to avoid crystallization and keep the liquid at the proper temperature, the sodium bisulfite storage tank needed a freestanding mixer mount attached on top of the tank to support a mixer. 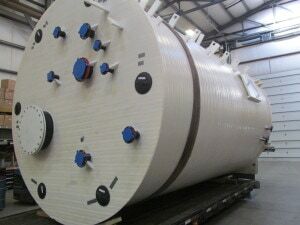 Unlike other plastic tanks, Houston PolyTank’s exclusive extrusion-wound construction creates extremely strong rigid plastic walls that can support the weight of the mixer right on top of the tank. The accessory that allows for easy access to the mixer is a ladder running up the side of the tank with the safety cage and handrail that connects to the mixer mount on top. There is also a clear acrylic pipe from a reverse float indicator that runs along the outside of the tank as well. With harsh chemicals, there is a need to minimize the potential for leaks. The float indicator is in the additional safety feature that allows operators to monitor how much liquid is in the tank without having an external site glass with product in it. This minimizes the opportunity for leaks and allows them to read the monitor easily. The lower the outside indicator is in the clear acrylic pipe, the fuller the tank is (see picture). Because of the tank’s extrusion wall and manufacturing process, Houston PolyTank is able to easily bolt electric boxes to the welded panels on the exterior tank wall. These mounted boxes house control panels for leak detection, fill line indicators, and supports that hold electrical conduit running to the tank. Other outlets on top of the tank house necessary sensors for the application. On the inside, there are two immersion heaters set 180° apart on the bottom of the tank. These heaters, along with the mixer, ensure a consistent temperature for the sodium bisulfite. There are downpipes connected to some of the external fittings. These pipes go down into the tank but are supported by the thick rigid tank walls. Got a complicated chemical storage challenge? Give us a call at (800) 852-8265 or request a quote here. Check out our catalog here for a full listing of tank options here.